Helen Conrad also writes as Jena Hunt and Raye Morgan. 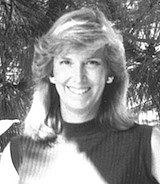 Helen Conrad was born on April 11 in Pasadena, California, U.S.A. and grew up between Holland, Guam, and California, and spent a few years in Washington, D.C. as well. She obtained a B.A. in English Literature. Helen was working toward a Master's in Library Science when she dropped out to have her first son. "One look into those baby blue eyes and I knew it was going to be a long time before I went back to school. But with young ones, you do have time to read, and the more I read, the more I learned about writing". She started writing because she felt guilty about spending so much time reading. "Through writing I figured I could still immerse myself in the stories I love, but I could actually claim I was working! The amazing thing was when I sold my first book and the excuse was justified. Dreams really do come true!" After years of writing romantic suspense in the style of Mary Stewart and children's books in a lot of styles, she finally sold a romance to Jove's Second Chance at Love and there was celebration all around-at least in her ever-patient family of husband and four boys. She published four more romances for Jove under the name Jena Hunt, then began writing Silhouette Desires. A few sales to Bantam Loveswept and Harlequin Romance, Temptationand SuperRomance under the name Helen Conrad followed, as well as to Harpers, Dell Ecstasy, Mills & Boon, and even an historical with Zebra. Today, she is concentrating on Silhouette Romance, completely captivated by the breezy fun and touching poignancy of their compact, to-the-point form. She feels the perfect "quick read" should make the reader smile, sigh and put the book down feeling better about the state of love in the world. Now, she lives in the Los Angeles area now with Nick, her geologist-computers cientist husband and the two of her four sons who still live at home. "Having the boys around helps keep me up on the current trends," she says with a laugh. "But writing helps keep me in touch with the romance that weaves through the everyday lives we all live." Raye Morgan is currently considered a "single author." If one or more works are by a distinct, homonymous authors, go ahead and split the author. Raye Morgan is composed of 4 names. You can examine and separate out names.